If you experience ongoing pain in the area near your ear, your jaw or the muscles on the side of your face, possibly accompanied by a clicking or popping sound or restricted jaw movement, you may be suffering from TMD — an abbreviation for Temporomandibular disorders. The temporomandibular (tem-puh-roe-mun-DIB-u-lur) joint (TMJ) acts like a sliding hinge, connecting your jawbone to your skull. TMJ disorders can cause pain in your jaw joint and in the muscles that control jaw movement. The exact cause of a person’s TMJ disorder is often difficult to determine. Your pain may be due to a combination of problems, such as arthritis or jaw injury. Some people who have jaw pain also tend to clench or grind their teeth, but many people habitually clench their teeth and never develop TMJ disorders. In most cases, the pain and discomfort associated with TMJ disorders can be alleviated with self-managed care or nonsurgical treatments. Severe TMJ disorders may require surgical repair. In some cases, the symptoms of TMJ disorders may go away without treatment. If your symptoms persist, your doctor may recommend a variety of treatment options. Pain relievers. If over-the-counter pain medications aren’t enough to relieve TMJ pain, your doctor or dentist may prescribe stronger pain relievers. Tricyclic antidepressants. These medications, such as amitriptyline, used to be used mostly for depression, but now are also used for pain relief. Muscle relaxants. These types of drugs are sometimes used for a few days or weeks to help relieve pain caused by TMJ disorders. Sedatives. If nighttime teeth clenching is aggravating your pain, your doctor might prescribe a sedative such as clonazepam (Klonopin). Bite guards (oral splints). Often, people with jaw pain will benefit from wearing a soft or firm device inserted over their teeth, but the reasons why these devices are beneficial are not well understood. Arthrocentesis. This procedure involves the insertion of needles into the joint so that fluid can be irrigated through the joint to remove debris and inflammatory byproducts. Injections. In some people, corticosteroid injections into the joint may be helpful. Infrequently, injecting botulinum toxin (Botox, others) into the jaw muscles used for chewing may relieve pain associated with TMJ disorders. Surgery. If your jaw pain does not resolve with more-conservative treatments and if it appears to be caused by a structural problem within the joint, your doctor or dentist may suggest surgery to repair or replace the joint. The National Institute of Dental and Craniofacial Research considers TMJ surgery to be controversial and recommends that it be avoided whenever possible. At New Age Dentistry of Albuquerque, our mission is to help patients regain total oral function through effective management of their TMJ dysfunction symptoms. Through our multi-faceted approach to TMJ pain relief, Dr. Grewal is able to develop tailored treatment plans that yield lasting results. 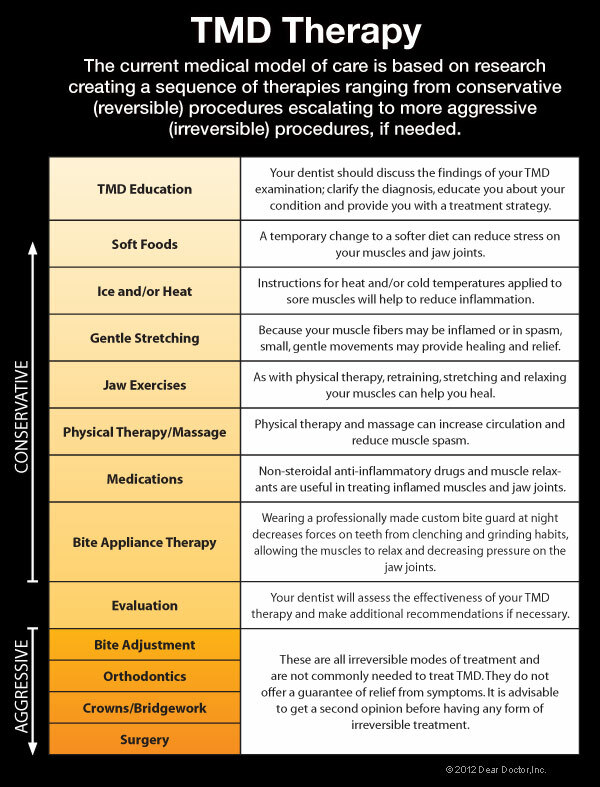 To schedule your TMD consultation, contact our Albuquerque Dentist today.